The Decision Science, AI and Natural Language Processing team at IBM Research-Ireland recently presented a conference paper called “Decision Conversations Decoded” at the 16th Annual Conference of the North American Chapter of the Association for Computational Linguistics: Human Language Technologies (NAACL HLT). The team also presented a demo of our virtual assistant prototype, which analyses collaborative decision discussions to identify alternatives and criteria. Development of this conversational analytics tool is part of a large body of research in natural language processing at IBM Research AI, a key factor in our mission to develop broad AI that learns across different disciplines to augment human intelligence. Natural language processing is a central component of IBM Project Debater, which debuted last week. Project Debater is the first AI system that can debate humans on complex topics and represents a big step toward mastering language, one of the great boundaries in AI. During the course of a day, we make thousands of decisions consciously or unconsciously, assembling the choices to help make a decision. As we gather information we also assess alternative resolutions. Some of these decisions are straightforward while others can be more complicated to resolve. In business settings, the decision making process may often be more challenging or prolonged and involve multiple parties. During such collaborative meetings, it can be difficult to actively participate in a discussion, while at the same time recording, tracking and identifying who said what, why they said something to who, or assess the resolution process. With the proliferation of recording devices in our professional and personal lives (e.g., teleconferencing, intelligent personal assistants or group chat exchanges such as Slack), it would be helpful to develop natural language processing-based engines to automatically extract decisions related concepts such as alternatives and criteria from decision conversations and make use of that information to facilitate the decision discussions. As a starting point, such a technology could provide the input to generate a visualisation of the decision discussion so that a group can consult it to identify underdeveloped ideas or options, and to recall points of consensus and dissent. It would serve as a summary, enabling people who have missed a decision discussion to catch up or more simply reminding a decision maker of the arguments that were raised so she can make her decision at a later time. The system output can also be used to document the decision making process in a structured way. This information in turn is key to better understanding power plays and negotiation in group decision making. More practically, it can be essential to prove compliance with processes, for instance a financial advisor demonstrating that she has presented reasonable investment alternatives to her customers. At IBM Research-Ireland we are looking at how the decision-making process can be augmented by automatically tracking a decision discussion through a virtual facilitator – one that analyses a discussion, extracts all the decision elements (e.g. the alternatives, criteria, constraints, and trade-offs), and groups these elements by topic, while associating all the alternatives to the decision support criteria. We have created and developed a set of information extraction algorithms, and combined these with a web interface to help facilitate decision discussions. It keeps track of the business options under consideration within the discussion and records what is being proposed by the meeting contributors. It organises the group’s collective thoughts into an overall summary on their decisions taken. It also illuminates how a particular decision was made and facilitates further discussions. 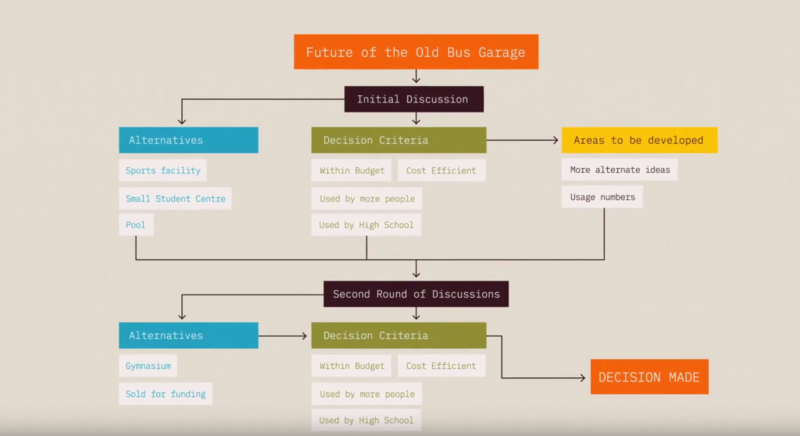 To identify decision elements within a meeting, we annotated a crowd sourced dataset known as the AMI Meeting Corpus, a multi-modal data set consisting of 100 hours of meeting recordings. We then labelled decision elements from the transcripts as alternatives (options being considered as solutions to the decision) and criteria (factors guiding the alternatives). This annotated corpus was then used to train a set of supervised classifiers for automatically extracting decision making elements. Another algorithm then processes the extracted decision and criteria to identify the expressed sentiment towards the extracted elements. In essence, if a participant mentions a specific alternative, it is important to distinguish whether he or she supports or rather opposes that specific alternative. Finally, a clustering approach is used on each class of extracted elements (alternatives and criteria) to group them semantically. For instance, the mentions of trendy, fashionable or stylish as criteria would be grouped together as they represent the same concept overall. As a virtual facilitator, the system objective is to augment collaborative decision making, empowering all stakeholders involved to contribute their perspective and making the decision making process effective and transparent. We envision our tool as an API for developers to enhance speech-to-text applications, and integrating it into a smart meeting room or conference call recording support functionalities. The potential for our algorithmic approach is wide-ranging for team meeting discussions, for example, in finance, design, human resources, engineering or in operational decision making processes across businesses and industries. To illustrate how our tool works we invite you to watch this short video.